Twelve years after making Spin (1995), the famous found-footage masterpiece created from pirated satellite feeds, Brian Springer released a dense, confounding feature documentary called The Disappointment: Or, The Force of Credulity (2007). I didn’t hear about it then. I don’t think many people did. A few years later, a friend had a DVD-R of The Disappointment on top of his TV, in one of those piles of "things to watch" that tend to accumulate. I asked, "What’s this? I love Brian Springer!" He grimaced. "I don’t know, dude. I couldn’t get through it. You’re welcome to borrow it, but it literally makes no sense." Those words—"it literally makes no sense"—stuck with me, because in a way they are accurate. The Disappointment doesn’t make literal sense, nor does it attempt to do so. It’s a crazy quilt of a film: home movie, philosophical essay, historical documentary. It tries to do too many things. It makes connections where surely none exist. It might be insane. It is my favorite work of art. You don’t need to understand a documentary in order to love it. The Disappointment is narrated by a mysterious artifact carved of limestone, supposedly dug up in Missouri in 1883. It looks like a fish, or maybe a lizard. Archaeologists can’t explain it, so it sits in a library basement, collecting dust and telling stories. "This is a true story of a family of discoverers," says the artifact. "Doris, C.W., Larry and Brian: the Springers." The Springers are treasure hunters. They’ve spent decades digging in a limestone shaft, looking for the diary of a Spanish explorer, and for gold. Home movies, interviews and family photos create a portrait of the Springers, a close-knit and loving family. But there’s something terribly wrong. It has to do with what happened to Brian’s father, C.W., in the Korean War. 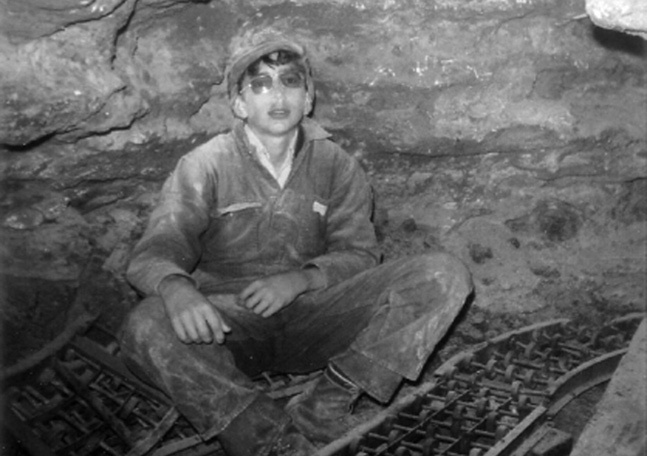 As a forward observer on the frontline, he watched "the enemy" hide out in caves. He watched them eat and shave. Sometimes they waved to him. C.W. then gave the coordinates of their location to his superiors, and kept watching, as napalm bombs ate them alive. When he returned home, he didn’t speak for weeks. One of things that The Disappointment does is explore the ways C.W.’s trauma possesses his wife, Doris, and devastates his children, Brian and Larry. This family history is slowly revealed, alongside other stories: a piece of rock art that functions as a historical marker, despite the fact that nobody knows what it means or who carved it; the "organ music" that played in C.W.’s truck all on its own; the forgotten life of anarchist Kate Austin. More ghosts. I could go on trying to describe this film, but there’s too much to say, and no way to say it. I’ve watched The Disappointment perhaps a dozen times. For me, watching this film is not only to experience a perfect, singular work of art; it is a kind of antidote to living in a world that privileges understanding and exposition at the expense of mystery and awe. It makes me remember that you don’t need to understand the world in order to love it. Penny Lane is a documentary filmmaker and artist who was named one of Filmmaker Magazine's "25 New Faces of Independent Film" in 2012. Her first feature documentary, Our Nixon, was released to wide acclaim in 2013.